Do not listen to ANYONE who tells you how you should invest your money, "right now"
I have said this before, but it’s worth repeating again and again. Do not listen to ANYONE who tells you how you should invest your money right now. Finance pundits and magazines are infamous for telling their readers or whoever will look at their articles about what they think you should do with your money right now. Everyday I see the same types of articles in the financial press telling you what you you should do with your money. They happen to be in different shapes and forms and wording. Their primary target are beginning investors. I’ll be the first to admit it - I took the bait. When I was a boy starting out in investing, I would seek out these kinds of articles articles to tell me what to buy. I did not know any better and these “helpful” articles where always around. I thought, "if these experts are telling people what stocks to buy, then these companies must be really good. They will go up and up and I'll make a lot of money!" I did not know any better at the time . After all, there wasn't anyone around to say otherwise. Just like there is now, countless financial media were spitting out these wacky companies all over the place that - YOU MUST BUY NOW. Yes, some of the companies are around today and doing great. Most of these companies went bust. The financial media of the time did not know what was going to happen. Do you think they care if someone lost all their money in a .com stock they said you should buy now? The financial media guesses are as good as yours. 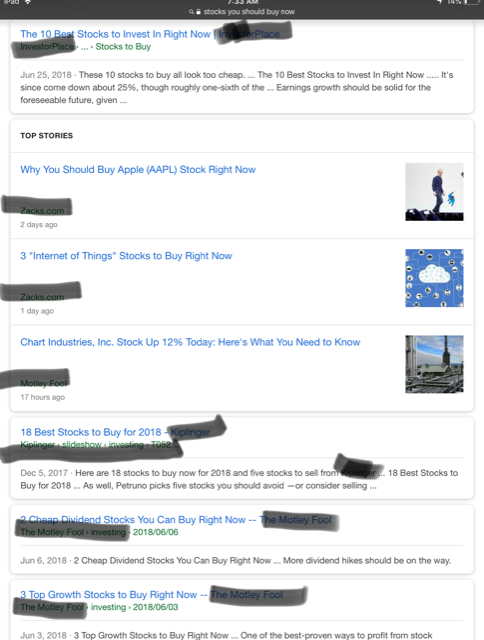 “10 Stocks You Should Buy Right Now” or some variation of this title. 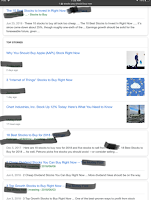 Over the last week, I’ve casually seen at least 7 of these articles across various financial media. Some were from the same content provider. Imagine buying everything they told you to buy, you’d need a lot of money! Better yet, think about WHY they have these articles in the first place. you ? Of course not! While these titles intrigue readers, which is why they publish these articles in the first place, their only purpose is to make money off of you! I’m not saying that these magazines are out to get you. Most people of them are very educational and many are funny and entertaining. Even the stocks that they put on their lists to buy right now might be compelling buys. It doesn’t mean you should do what they say. Even if they present a detailed analysis with all these facts and figures and positive points left and right. Challenge it. It’s your money at stake, not theirs. Do you own due diligence. And if they are wrong with their picks, and you lose your money, they have no accountability, they have no sympathy. But they do have your money, your email, you web trend information, your site traffic statistic. This is all money making information and that's all that matters to them. Please try to keep all this in mind when you come across these articles. Keep Track Of Your Net Worth: Hopefully you now know a little bit more about some of the financial "gurus". Now the easiest way to grow your wealth is to know where all your money is going. Sign up for Personal Capital, the best free financial tool on the web. I use them and have seen my income and net worth blast off. They keep me motivated to budget, spend and invest wisely.